Decathlon is an e-megastore which stocks a huge range of sports goods. The e-store deals in more than 5,000 Sports Products covering over 50 different sports and adventure sports including Cricket, Football, Athletics, Swimming, Scuba diving and Hiking to name a few. Decathlon Offers for MenDecathlon is your one-stop destination for sporting goods of all kinds. From tennis rackets to advanced scuba diving equipment, Decathlon has them all. The superstore - introduced by Michel Leclercq in Lille, France in 1976 – today has branches in Germany, Italy, Portugal, the United Kingdom, China, India, Malaysia, and other southeast Asian countries. In totality, Decathlon employs a staff of over 70,000 from 80 different nationalities. Products offered at Decathlon are divided into four categories – Men, Women, Kids, and Accessories. Wanna try them out? Use Decathlon coupons listed on GoPaisa.com and stand a chance to earn extra cashback. Men are usually fitness freaks and spend hours in gymnasiums and other sporting activities. Decathlon has a wide range of products for such fitness-conscious men. Some of them include backpacks, base layers and shirts, beanies, bermuda shorts, and cycling tights. The list doesn’t end there. It also houses some quality board and boxer shorts, breeches, caps and carry bags, cropped leggings and Trousers, cycling shorts, down jackets, and fastening buckles. Furthermore, the store also has an exclusive range of fleece, gloves, hats and insoles, jackets, laces and leggings, leg warmers, shirts, and t-shirts. Also, included in their repertoire are massage balls, neoprene suits and wetsuit socks, over trousers, padded cycling shorts, pullovers, and running mid-tights and shorts. Along with these you can also shop for short-sleeved jerseys, jackets, slickers and slippers, socks, storage covers, and sunglasses. Sweatshirts, surf shorty wetsuits, swims shorts, tracksuit, travelling bags, trousers, undershorts, uniforms, and windbreakers too can be found at Decathlon. You can buy all these at an affordable price using Decathlon coupons listed at GoPaisa. It is important to teach the kids the importance of regular exercise. To keep your kids fit and active, there are a number of equipment that inspire them for regular workouts and motivate them to participate in outdoor activities. At Decathlon you will find a number of such products like swimsuits, backpacks, bag covers, beanies, Bermuda and board shorts, and breeches. The list also features briefs, caps, carry bags, child bike seats, clamping straps, cropped leggings, trousers and tops and cycling shorts. 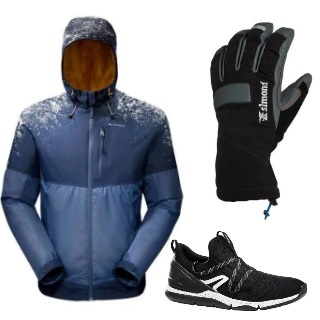 Long with these Decathlon also has a wide and exclusive range of down jackets, fastening buckles, fleeces, gloves, hats, insoles, jammers, and jerseys. Their collection further features laces, leggings, long-sleeved t-shirts, masks, massage balls, neoprene suits and wetsuits. Socks, gloves, over trousers, pullovers, rolling suitcases, running mid tights and shorts, and shoes are also a part of their catalogue. The repertoire also consists of short-sleeved jersey, shirts and t-shirts, skirts, sunglasses, surf shorty wetsuits, sweatshirts, swim bottoms, swim briefs and shorts. At Decathlon, you can also search for tights, tops, travelling bags, trousers, uniforms, watches, whistle and windbreaker for your little ones. The best way to purchase these at Decathlon is by using Decathlon coupons codes listed at GoPaisa. Decathlon inspires people for regular work outs and tries to make things easily accessible for everyone. Hence, they have a list of accessories that will assist them in their exercise and sports. Here you will find ankle brace supports, bike lights, bindings, binoculars, calf supports, and cleansing wipes. The list does not end here. You can also search for compasses, earphones, elbow supports, fitness monitors, fit over sunglasses and foam rollers at Decathlon. Also, added to the catalogue is a wide range of glasses cases, clips, and straps, headlamps, heart rate monitors, insoles, knee supports and lanterns. The accessories section at Decathlon even features lumbar belts, massage accessories, and devices, monocular, pedometers, scales, shoulder braces, smartphone armbands and stopwatches. These not just ease the pressure of workout but also ensure safety. Buy these accessories via GoPaisa and get Decathlon coupons to save some extra bucks. Decathlon is that one website that has various equipment required for different sports and outdoor activities. Be it outfits, equipment or accessories related to any sports or activity, Decathlon has them all. Along with the products, Decathlon also has for its users ultimate fitness advices. Go through their blogs and know what is the best for you. Get the best of the Decathlon products at low price with Decathlon coupons listed at GoPaisa. When you shop for a Decathlon products via GoPaisa, you will come across a number of Decathlon coupons and promo codes that will make shopping affordable. These coupons will give you an added discount and assured GoPaisa cashback on your purchases. The cashback amount can be later redeemed to make mobile phone recharges, bill payments, shopping, etc. You can also put forth a cash out request and get the amount transferred to your bank account. Here is a simple guideline that will make shopping at Decathlon via GoPaisa a great shopping and saving experience. • Log in to GoPaisa and search for Decathlon. • Here you will find several Decathlon deals. So, click on the deal that you find best. • Once you click on Activate Deal, you will be redirected to Decathlon.com.